BEIJING—In January 2015, Xiaomi Corp. founder Lei Jun announced to his staff in an open letter that the Chinese smartphone maker was the world’s most valuable technology startup. “We will journey into the constellations, to places where others haven’t dreamed of,” he wrote. Living up to those high expectations has been a challenge. Xiaomi missed its 2015 sales target of 80 million smartphones, according to people familiar with the company, and investors are beginning to question its $46 billion valuation, which was based on yet unrealized plans to generate substantial revenue from Internet services. China’s economic slowdown, coupled with turbulence in the stock market, is prompting investors to take a second look at China’s high startup valuations. Startups such as Xiaomi, which raised vast sums on China’s mobile Internet boom, are now facing growing pressure to live up to expectations. “With China’s economy slowing, many startups will need to be more cautious in their expansion strategies,” said Nicole Peng, an analyst for market research firm Canalys. Xiaomi shot to the top of China’s smartphone market in 2014 with the novel idea of selling hardware by gathering a large user base, a business model usually favored by Internet companies, not those selling a physical product. Sales that year tripled to 61 million smartphones, compared with a year earlier. Mr. Lei cultivated fan clubs and used “flash sales” to sell smartphones with iPhone-rivaling hardware at a fraction of the price. He swallowed thin margins, betting he could later sell services to users. Investors swooned. In December 2014, Xiaomi raised a $1.1 billion round that valued it at $46 billion, topping even ride-sharing startup Uber Technologies Inc. at the time, although Uber has since regained the lead. But Xiaomi’s smartphones, which once sold out in minutes in limited batches via online flash sales, are now easily available—a shift that analysts say signals slowing demand. 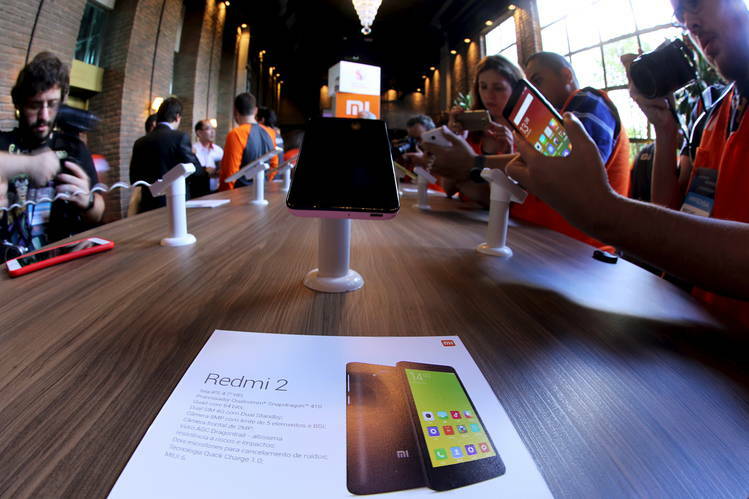 A slowdown in China’s smartphone market has laid bare Xiaomi’s weaknesses. Xiaomi has lost market share against established competitors with more financial and technological firepower, such as Huawei Technologies Co., which launched a high-end smartphone line and overtook Xiaomi as China’s top handset maker in the third quarter 2015, according to research firm Canalys. Huawei, which sold more than 100 million mobile devices last year, is beefing up its marketing in overseas markets in a bid to challenge Apple Inc. and Samsung Electronics Co. , the world’s two biggest smartphone makers. Huawei’s engineering strength and brand image built up over decades make it difficult for Xiaomi to compete in China, analysts say. The lack of its own high-end chip technology also proved to be a competitive disadvantage for Xiaomi in 2015. When early versions of the Qualcomm Inc. ’s Snapdragon 810 processor were reported to overheat, it dampened sales of Xiaomi’s most expensive handset yet, the 2,299 yuan (US$349) Mi Note, analysts said. Xiaomi couldn’t fall back on an in-house developed chip to get around the problem, as Huawei and Samsung did. Xiaomi and Qualcomm declined to comment on the processor. Analysts say the problems have since been fixed. Overseas growth has also been slow for Xiaomi, with the percentage of its smartphones sold overseas in the first nine months of 2015 rising to 8%, compared with 7% in the 2014 calendar year, according to Canalys. It faced tough competition overseas, and found consumers unaccustomed to online phone-buying, said Ms. Peng, the analyst from Canalys. Xiaomi’s thin patent portfolio also became a hurdle as it sought to expand in markets such as India. A lack of patents led to a court ruling that crimped its access to the crucial India market. In December 2014, India’s Delhi High Court ordered Xiaomi to stop selling all smartphones not running on Qualcomm chips due to a patent lawsuit filed by Sweden’s Ericsson. A year later, the injunction remains, which means Xiaomi can’t sell its popular models running chips made by Taiwanese chip maker MediaTek Inc.
Xiaomi said it sold 3 million smartphones in India from July 2014 through August 2015, and 1 million smartphones there in the third quarter. Its average quarter-over-quarter growth is 45%, it said. The lack of a diversified customer base is another challenge for Xiaomi. It remains “locked in a Chinese demographic ghetto of mainly males 18 to 30,” said Peter Fuhrman, chairman of China-focused boutique investment bank China First Capital. Xiaomi’s focus on low prices has hit its brand image, he said. Xiaomi’s average smartphone price fell to $122 in the third quarter from $160 a year earlier, despite China’s smartphone sector moving upmarket, according to IDC. The average price of a smartphone in China rose to $240 from $202. Huawei’s rose to $209 from $201. Xiaomi’s best-selling model last year was its cheapest, the $76 Redmi 2A, IDC analyst James Yan said. Xiaomi’s supporters say the outlook is still bright, as it shifts to building an ecosystem of smart home products. The company has invested in 56 startups so far, ranging from iconic scooter maker Segway to a manufacturer of air purifiers, essential in China’s smog-choked cities. 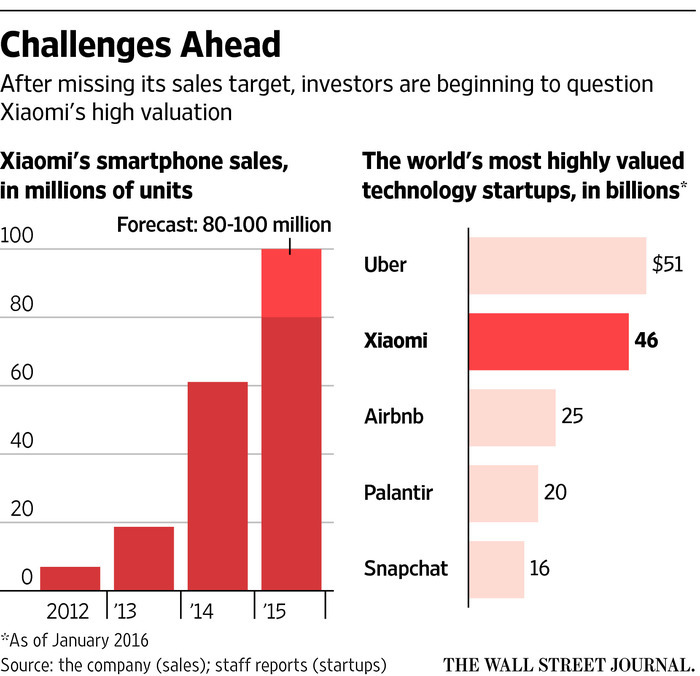 “Xiaomi’s promise lies in its ecosystem,” said Steven Hu, former partner in Xiaomi investor Qiming Venture Partners. “Mobile services, e-commerce, branded consumer products—these still are largely just a figment rather than a huge and growing source of profits that could validate last year’s sky-high valuation,” said Mr. Fuhrman.